With the long-term benefits of solar power becoming more evident and attainable, applications of solar energy are always growing, one system which has been used from Johannesburg the White House are solar water heaters. Solar water heaters are one way for home and business owners to lower the cost of heating water by replacing electricity or gas with the abundant energy of the Sun. There are many options when choosing to heat water using solar, however the most generally used and effective means are the active solar water heaters outlined below. 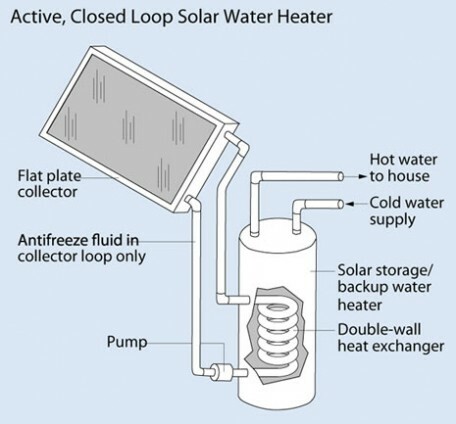 Active solar water heating systems consist of three basic parts, the pumps that move water through the system, a solar collector which gathers solar energy for heating, and a storage unit.There are two types of active solar water heating systems, direct and indirect. Direct circulation systems circulate household water through outside solar heat collectors before it is brought back into a storage tank inside the house. 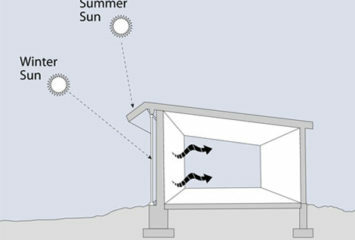 The solar collector is usually placed on the roof and can vary in size. Systems using indirect circulation are different in that they utilize a non-freezing, heat-transfer fluid that is pumped separately from the water through a solar collector and a heat exchanger to provide heat to the storage tank. As the different varieties of heat-transfer fluid are considered, be aware of a basic trade-off. The best substances to use are those with low freezing points, and high boiling points, like silicons and refrigerants, however these also have the highest viscosity, meaning they will require the most energy to pump. When choosing between active and inactive systems, the most important factor to consider is climate. Direct systems are best used in climates where freezes are rare, while indirect systems are far better suited for areas prone to freezes. Also keep in mind solar hot water systems also require a well-insulated storage tank to prevent energy loss just like gas or electric systems. Images above made available through the US Department of Energy. As with any major change to your home, the installation of a solar water heater is not something to do on a whim; without proper consideration, this system may only be as green as the money you’ve lost. However if done correctly, the long-term savings in energy will be all too obvious. First and foremost, consider the solar availability of your home. Your solar system will collect both direct and diffuse solar energy, meaning even homes and sites in less sunny and warm climates can be used. Look for an unshaded location on your home, especially one that can face South (if you’re in the Northern Hemisphere), as a requirement. Also, try to match your home’s energy needs with the size of your system. For a ballpark estimate of the size of the solar collector needed, most contractors calculate about 20 square feet of solar collector area for the first two members of a household, then an additional 8-14 square feet for each additional member. To power the storage unit, find a storage tank with an appropriate volume and then assume that for each 1.5 gallons, about 1 square foot will be needed. Lastly, make sure your system complies with all local building codes and regulations, and check for state incentives. To see what incentives are offered in your area, www.dsireusa.org can be a useful resource. 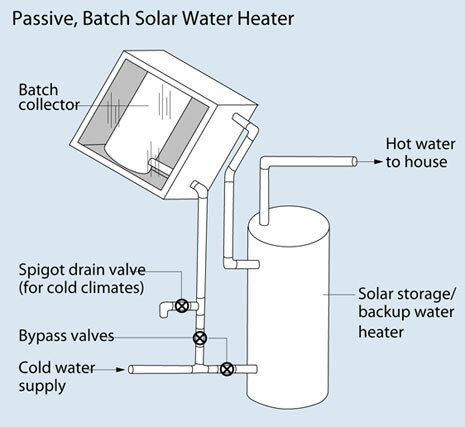 Unlike some solar collection systems, solar water heaters can actually be installed manually with DIY kits. These kits will include the water storage unit and a solar collector, along with all other necessary parts, such as pumps, controller and sensors. With these items acquired, it is entirely possible to install this system yourself, however consulting a certified thermal systems contractor will ensure that the system is installed safely and with maximum efficiency. For more on the subject check out our post on do it yourself solar pool heating.